Like its American counterpart, British rock'n'roll started in 1954 and one record began it all, as did Elvis with "That's All Right." But unlike the States, where rock was essentially a melding of R&B and country, sung by a white performer, in Britain it was much less electric - but equally electrifying. It all began when jazz trombonist Chris Barber left Ken Colyer's band to strike off on his own. Trad jazz had an audience, enough at least to keep small bands playing in the clubs. Barber had persuaded singer Lonnie Donegan to defect with him and during the intervals, Donegan and a few musicians, entertained the crowd with a music called "skiffle," something that had started when they were still with Colyer. It went over very well, especially with the younger crowd, who loved what was essentially a jumped up version of American folk music. When Barber went into the studio to record his New Orleans Joys LP in July 1954 (this was in the days of ten inch vinyl), he let Donegan sing two songs from the skiffle set, John Henry and Rock Island Line. In a large part, thanks to those two numbers, the LP sold 50,000 copies - an unprecedented amount for a jazz group. Suddenly skiffle was on the radio, the first British teenage music (indeed the word teenager was just barely coming into use, imported from America) to hit the airwaves. 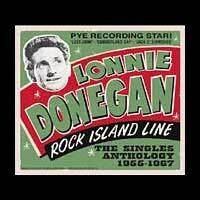 Knowing there was money to be made, the label (Decca) released "Rock Island Line" as a single. Rock Island Line was an immediate, overwhelming hit. By today's standards it was the kind of success artists can only dream about. It spent an almost unbelievable eight months in the charts, even though its highest place was only number six and sold a reported three million copies. Of equal importance, it became a hit in America, making Donegan the first modern British star to achieve any kind of success there. In the States it hit number eight and Donegan himself performed on The Perry Como Show on American TV. Despite the fame and success of the record didn't make him rich; he'd merely received a fee of £50 for the session. So what was it about Rock Island Line that created such a sensation? For a start, most people in Britain had heard absolutely nothing like it before. It was faster and rawer than most music and sung with feeling rather than skill. There was also the fact that it was a folk song, not a product of Tin Pan Alley - but it wasn't gentle or twee. Instead it proceeded at a gallop and never let up. It was new, but at the same time the innate folk melody wasn't too far removed from the experience of most people. Buying it was an act of teenage rebellion, of standing up for the new - and there was precious little that was fresh in those days - over the old, tired formulae. Its success in America is possibly even easier to understand. There the song was a standard of sorts, one known throughout the country. That helped. Rocking it up brought in the young market who wanted something faster but not as "dangerous" as Elvis; in a country where racial lines were often carefully drawn, it was a song associated with the white tradition. It was rock, but it was safe. So it was, that the first salvo of British rock rang around the world.